"Just an old family recipe that I have been told is reminiscent of KFC coleslaw. You be the judge! To speed things up I sometimes just buy an already shredded bag of cabbage with carrots in it and then just chop it a little finer." 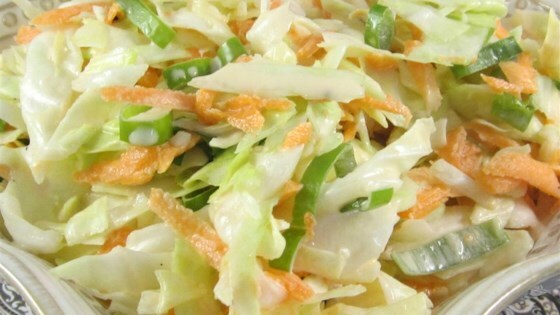 Mix cabbage, carrots, and onion in a large salad bowl. Whisk mayonnaise, sugar, milk, buttermilk, lemon juice, vinegar, salt, and black pepper in a separate bowl until smooth and the sugar has dissolved. Pour dressing over cabbage mixture and mix thoroughly. Cover bowl and refrigerate slaw at least 2 hours (the longer the better). Mix again before serving. A creamy, tangy, vintage slaw handed down through the generations. Loved it. Just like KFC. I substituted 1-16 oz. bag coleslaw mix for the cabbage, carrots, & onion. Didn't do any additional chopping. Delish. Delicious! I did not have buttermilk so I increased the milk to 1/2 cup and the vinegar to 1/4 cup. My son is a coleslaw lover but I've never been able to make a recipe that he liked until now! This was a great, standard coleslaw recipe. I added only half the sugar and still thought it was pretty sweet. Next time I might try it without the sugar and see if I think it needs it. Good recipe, consider using Stevia instead of sugar, makes it diabetic friendly. Follow directions for Stevia, is sweeter than sugar.